Mark A. Bowen, a loving husband, son and brother was called home to be with the Lord on Saturday, August 26, 2017 at the age of 39. 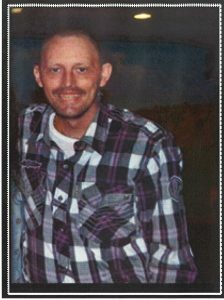 He was born March 25, 1978 in Louisa, Ky., to the late Jessie Lee Bowen and Debra Goble Johnson of Inez, Ky. In addition to his father he is also preceded in death by paternal grandparents Noah and Magdalene Bowen and maternal grandparents Jack Ivan and Lavon Goble. Mark is survived by his best friend and wife of one year and seven months, Linda Lee Bowen of Inez, Ky., loving mother Debra and step-father William Johnson of Inez, Ky., two brothers: Nathan (Marie)Bowen of Louisa, Ky., and Ryan Johnson of Inez, Ky., and one sister: Ealita (Tim) Stumbo of McDowell, Ky., and several nieces, nephews and friends. Mark was a light to his family, friends and so many others. He is loved and will be missed by many. Funeral services will be held 11:00 am Tuesday, August 29,2017 at the Vineyard United Baptist Church with burial to follow in the Goble Cemetery, Louisa Ky., Richard “Doc” Maynard and Dave Bowen will officiate. Friends can visit the church after 5:00 pm Sunday and until time of services on Tuesday. Arrangements are under the direction of the Phelps & Son Funeral Home, Inez.